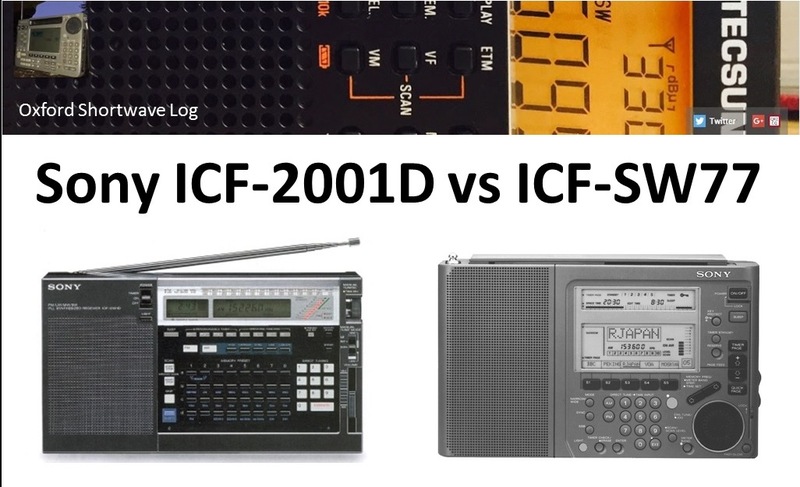 Hi there, after the first set of recordings were analysed, the score was 4-3 to the ICF-2001D, demonstrating how similar these two great receivers are in overall performance. There were a copule of notable differences however. The synchronous detection circuit on the ICF-2001D allows the user to effectively tune through a signal in 01. kHz steps, whilst the receiver automatically locks onto either the upper or lower sideband, depending on the frequency offset. The ICF-SW77 synchronous detection system differs in that the user must tune the signal and select the sideband. The results of this test confirmed that whilst the ICF-2001D almost always retained SYNC lock, the ICF-SW77 was very prone to losing lock, which of course affected the audio quality in many cases. The other issue was with the ICF-SW77 in that the narrow audio bandwidth filter often seemed to deliver ‘muddy’ audio. Whilst this feature proved to be excellent in terms of mitigating adjacent channel QRM, it also reduced signal clarity/ audio discernibility a little too much in my opinion. However, overall, sensitivity and selectivity was very similar between both radios – in fact, one recording had to be judged a draw (Radio Bandeirantes, Sao Paolo on 9645.4 kHz) – I simply couldn’t split them. Part two of the reception testing follows, using signals from Canda, DR Congo, Brazil, Cuba and Peru. This entry was posted in AM, DXpeditions, International Broadcasting, Manufacturers, Mediumwave, Portable Radio, Radios, Recordings, Shortwave Radio, Shortwave Radio Reviews and tagged CFRX Toronto, DXing, DXpedition, Radio Alvorada, Radio CANDIP, Radio Comparison, Radio Cultural Amauta, Radio Rebelde, Radio testing, Radio Verdes Florestas, shortwave listening, Shortwave Radio, Sony, Sony ICF-2001D, Sony ICF-2010, Sony ICF-SW77, Wellbrook ALA1530, Wellbrook loop on November 16, 2016 by Clint Gouveia.